Teenie! Thanks for reading and finally commenting! It's fun knowing that you're up to date on what I'm knitting. Anytime you want to hang out and brush up on your knitting skills let me know. Chris says hi. Love you! I finished my Girasole blanket and it's even more beautiful then I had hoped! I brought it to my parents house this weekend and blocked it on their king size bed. But wouldn't you know I forgot my camera! I'll get finished shots of it soon, I swear. Today I did some dyeing and then I spent a fit of the afternoon drafting some fiber. I hope to get some spinning done this evening. My fiber is all drafted and ready to get spun up into something beautiful. Congratulations Jessica! Twilight is going home to you. 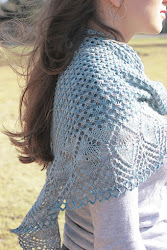 In your comment you mentioned that you'd make a swallowtail shawl out of it, that would be amazing! I would love to see the finished result! I actually had to pick a winner twice, I assigned a number to everyone who commented and then picked a number from a hat. The first number I picked was number 5, so when I checked who's comment that was it ended up being my little brother Vince! I call him my little brother, but he's not that little, he's less than a year and a half younger than me. Vincent is my biggest fan, he lives in Vancouver (I'm in Montreal) he reads my blog and always leaves me comments. I love it, it makes me feel closer to him because I miss him when he's so far away. He has a great blog all about his life as a masters student and a triathlete. At any rate, he doesn't knit, and has zero use for a lovely skein of sock yarn, so I vetoed him as winner. I can't believe he actually won! Thanks so much to everyone who commented, it was really fun to get feedback from people. Because I enjoyed it so much, we're doing another giveaway. Same principle as the last one, leave me a comment (if you include your e-mail address it makes it easier for me to get in touch with you to tell you that you've won!) I'll pick a winner next Friday. This weeks giveaway is two 50g skeins of sock yarn in a lovely turquoise colourway that sadly has no name. Feel free to leave a suggestion for a name in the comments! 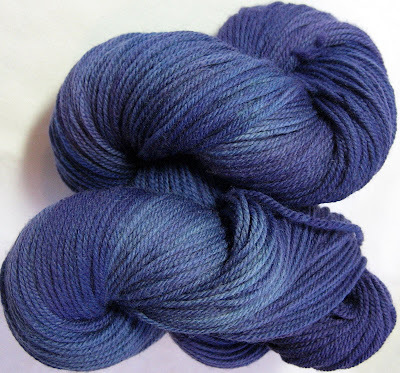 Back when I was experimenting I was dyeing in 50 g skeins, with the two of them, you'll have plenty of yardage to make socks, a scarf, a shall, a baby sweater, you name it. I'm particularly fond of this colourway, blue has always been my favorite colour, and especially blues that lean towards turquoise. Girasole is coming along, but despite my race to see it finished I've had to put it on hold for the last couple of days. It's been hot here! The weather said that it was 30C, feels like 37C. That's too hot for big wooly blanket knitting, so instead I've been swatching. I think I'm going to design a sweater using the textured stitch shown above. It'll be my first design and I'm very excited about it! My swatch has just finished blocking and now I'm going to try and remember how to do math so I can figure out how to design a sweater! I'll keep you posted. I've also tried my hand at designing my first sock! Here she is in progress. I'm quite pleased with it and think that it could look pretty great when it's all done and blocked. Check out Connie's blog over at Pick Up Sticks, she's putting me to shame by knitting her Girasole out of Tanis Fiber Arts Aran weight in Chestnut. Why didn't I think of that!? I can't wait to see this beauty finished! I haven't exactly gotten into the habit of regular spinning yet. By the end of the day, when I sit down to do something relaxing, I pick up my knitting. For me, spinning is interesting and challenging, but not yet mindless and easy. I have to be in the right mood for it. Once I get started, it's quite peaceful, kind of like yoga, because it's so repetitive. Saturday I was in just the right kind of mood, so I picked out a braid of my hand dyed roving and spent the evening spinning what became this 2 ply yarn. It's about 130 yards, not as much as I'd like to be able to get out of 4 oz of roving, but still better than my previous trials. It's really encouraging, because I seem to get better every time. I still have to work on keeping my singles light and lofty instead of tight and overspun. Some sections turned out pretty well, but others are still too tight. Pinks and plums and dark greys, I think it's kind of lovely! This one may turn into a simple hat, I think I have enough yardage... maybe a child's hat! 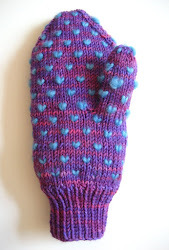 I do have a lovely god-daughter who loves to receive hand knit gifts! Now we get into the list of unfortunate things I've been thinking about lately. 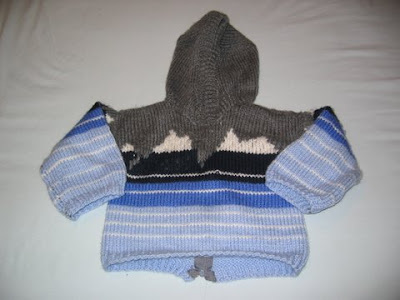 This sweater (Assemblage from Norah Gaughan Vol.3) has been on my mind since the day it was finished. I love this pattern. I love the cables, I love the casual fit and the big loose collar... unfortunately something is just not right with it because I haven't even worn it once. I think that the problem is in the length of the sleeves. They're just too long and get in the way. I'm considering having a serious sit down with it and taking out the sleeves, undoing the sleeve cap and a couple inches in the upper arm, then re-knitting the sleeve cap and sewing them back to the sweater, then I'd have shorter sleeves and perhaps a sweater that I'd wear. At least this was knit in pieces, so I can alter some things without having to re-knit the whole thing. I'm not sure, I'll have to try it on again and see what I think. The body was a bit big too... it just kills me that I've got such a beautiful pattern and such a beautiful yarn and a sweater that I don't use, maybe this one will just have to find a new home with somebody one size bigger than me? This one really bums me out too. I bought this pattern book because I was in love with this pattern. I made a critical mistake that was due to sheer inexperience. As written, I was pretty sure that the sweater would end up being too big for me, so I made a couple of changes. In the end, the thing fits perfectly, except for one major detail, the cable that goes horizontally around the shoulders has very little stretch, in trying to make a smaller sweater I knit the cable a tad shorter then was written and now when I raise my arms the whole cabled section pops up over my shoulders. Not super practical, I'm always pulling it down and trying to remember to keep my arms by my side. This is one that I'll have to just deal with, because short of starting from scratch there's no way to fix it. I still wear it, just not as much as I would if it didn't have that pesky little problem. 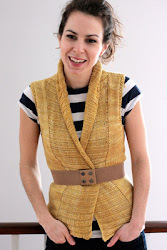 Lastly, we have the Aran Accent Vest. 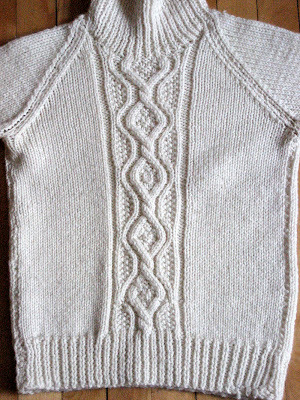 The pattern is in the same Patons booklet as the previous sweater. Again, great pattern, lovely yarn, it turned out just right, except I don't wear it. Basically, it's just not my style. Not much more to say about this one, I think I'm just going to hang on to it and see if my style changes. After all this reflecting, I think I've come to a conclusion. I've got knits that I love to wear, knits that I don't, but in the end it doesn't really bother me. I loved knitting all of them. I guess I'm a process knitter. I like working on projects, learning new things, and when they're done I like petting and ogling my finished projects, but I don't mind wether I wear them or not. Which is a great thing, because I seem to have a habit of knitting great pieces that I don't wear, good thing I'm ok with it. I love the comments that I'm getting for the giveaway! I knew this would be fun, I'm going to pick a winner next Friday, so you've got until then to submit a comment and be elligible to win. I'm making some serious progress on my Girasole blanket. I tried to get a shot of it today to prove it, but it's grown so large, I've got 640 stitches on my needles, and I wasn't able to get a photo of it looking like anything other then a big beige blob. This blanket has somehow turned into a race. I'm determined to see how fast I can knit it. I'm not sure why, maybe because my last two blankets took years, or maybe because I just love it, or maybe because I can't really see how beautiful it is until I've cast off and can really stretch it out and admire the lace. Either way, I'm predicting I'll have this finished in a month, start to finish. That gives me until July 11th, just under 3 more weeks, piece of cake! I've been thinking a lot about my knitting lately. That's no surprise really, I think about knitting pretty much all the time. Mostly about what to cast on next, I'm a list person, I just write things down and then look forward to crossing them off. But now I'm not only thinking about my next projects, but also my past projects, both successful and not. Today's post is part 1, where I'll discuss successful past projects and thoughts on future projects that are inspired by them. I knit this little mountain sweater (I think it's for a 12 month old) for my god daughter about 3 years ago. She looked adorable in it, I loved knitting it, and I still love this pattern. I still love the design of this thing. 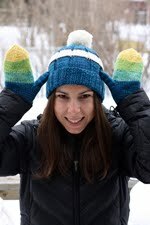 At the time that I was knitting it I had dreams of someday knitting myself a mountain range sweater, I was looking through my Ravelry projects and saw this picture and was reminded of how much I still want one in my size! (This sweater zips up the back, apparently it makes it easier for parents to dress their kids, mine would not zip up the back, it would make it impossible for me to get dressed by myself and would therefor be really weird.) So, this sweater is on my mind, cute no? Next up we have the striped sweater that I cut up to make Stella's sweater. I still love this, I'm ticked that I was so stupid and totally disregarded my gauge. I told you about that right? I swatched, got a gauge of 5 stitches to an inch, then promptly did all my calculations and cast on based on a gauge of 4.5 stitches to an inch. I really don't know what I was thinking. I guess I was just really excited to get started and didn't take the time to think, then I steeked it and made it unsalvageable, then it became a dog sweater. Hopefully version 2.0 will be in the works soon, I want to wear this sweater! This picture really takes me back! This is the first sweater I knit for Chris years ago. Before I knew anything about good yarns, and I'm sorry to say, this was knit out of Red Heart, Walmart, super cheap yarn. At the time I was not very confident in my knitting abilities and wouldn't have risked spending much money on yarn for a sweater, so Red Heart seemed like the perfect solution, which was probably a good thing seeing as how this sweater required quite a bit of surgery to make it fit. It would have been a real waste of good yarn. Chris told me exactly what her wanted and this was it. Of course, now the sweater is stretching and pilling and is pretty much unwearable. I told Chris it was time for me to knit him a new sweater, whatever he wanted, he wants exactly the same thing! But this time in a better yarn. I'm thinking Cascade Eco Wool, I'm loving it right now and know that it will make a great fall jacket/sweater. 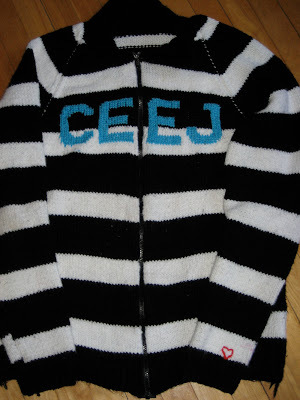 Ceej is Chris's nickname. Everyone calls him that, I think that this time around I may try to do the writing in handspun, or at least in my hand dyed yarn. This is a high contender for my next project. Lastly, this is the first successful sweater I ever knit. I wore it for years, it somehow ended up fitting perfectly. I accidentally made it with super cute 3/4 length sleeves and great stand up turtleneck that eventually slouched over the years. It's probably my most worn knit. But now it's dead. So I've got to replace it with a newer, better version of the perfect turtleneck sweater. Honestly, this sweater was full of so many accidents and mistakes that somehow resulted in the perfect sweater that I don't think I could ever repeat it exactly. But hopefully I'll come close. Of course I've got tons of other projects on my mind, but these are the ones that have been lingering for a while and feel more like unfinished projects rather then un-started projects because they're based on existing things. I may never get around to getting them all done, but now that I've made a list, hopefully I'll be more inclined. Next up will be my reflection on perfect projects that unfortunately went wrong... can they be saved? I started a new project last week, Brooklyn tweed's Girasole. I'm knitting it in Cascade Eco Wool, and everything about it so far is fantastic. 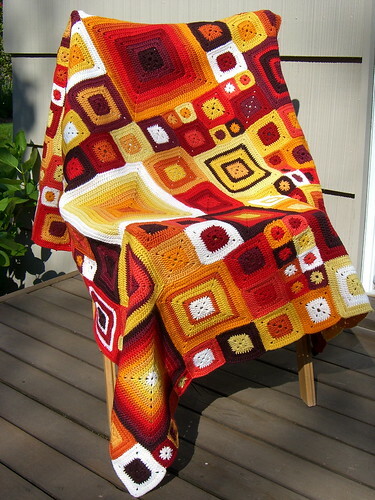 I just love it, the pattern, the yarn, definitely a match made in heaven. It's my first time knitting with Eco Wool but it's become a fast favorite, I'm already planning fall sweaters to knit with it. I finished my last blanket in just over 2 years, but this one I'm hoping to crank out in much less time. It's more like knitting a big chunky shawl, and with all the different lace patterns, there's always something to look forward to. In less than a week I've knit through one entire 250g skein of Eco Wool and have started on my second (the photo's were taken while I was still on the first skein.) Most of the time it just looks like a big beige blob. But every once in a while when I stop to stretch out the fabric and admire the beautiful petals that are forming I get really excited. I'm still working on a couple other projects, a simple pair of socks, a graphic lacy scarf, but this big boy has really captivated my interest, so unfortunately for you, there's going to be a lot of beige on the blog for the next little while. Don't worry though, in order to spice things up, I've got a couple surprise give-aways planned! Sorry for the week long absence here on the blog. I've been in Halifax for a grand reunion. Six best friends got together in Halifax where we all met at school to celebrate Jenna who is getting married in the Fall. It was an amazing week, we hadn't all been together in 3 years. I didn't do much knitting, all my time was spent eating, drinking, shopping, walking and mostly talking. I'm back home now and back at work so hopefully I'll have something to share soon. I received this book in the mail today and am excited to learn another new fiber craft. I hadn't had that much interest in crocheting, but then I saw this, followed by this and this and I knew I had to at least had to buy a book get me started. I've been thinking about this for a while now, and a couple weeks ago I finally took the plunge... I bought a spinning wheel! Sorry for the terribly unglamorous photo of it, I think it's actually very pretty and neat looking in real life. I decided on the Lendrum Double Treadle. I bought it from Paradise Fibers and I can't say enough good things about them. I placed my order, and 5 minutes later I got a call from them letting me know that though I live in Canada, since the American's get free shipping they were going to give me the equivalent off my Canadian shipping! So I only paid $12 to get this beauty shipped. Plus I got a bunch of complimentary fiber of my choice, some of which I've already spun, they were super nice and I'm happy that I bought from them. One of the reasons why I was taking so long to buy a wheel is that though I had decided on the Lendrum a while ago, it's a Canadian company, but I couldn't find a Canadian store to buy it from, which I felt a little weird about. It all worked out in the end. I don't know any spinners. 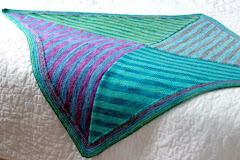 I've managed to befriend Kari at Mudcreek (check out her sold section for some awesome inspiration!) and pestered her with questions when I was trying to decide what wheel to get. She was very helpful and is actually in the process of spinning up some of my hand dyed roving for me, so when I get it back I'll have a great example of really good handspun to try and copy. I learnt exclusively from googling, practicing on my drop spindle (which I kind of hated, so I was nervous that I wouldn't like my wheel either, but I was wrong!) and by reading this book. Also just by studying other yarns, and lots of trial and error. Not so hot... (I didn't even take a picture of my first attempt) I learned a lot from that trial, mainly that pre-drafting is super important for me because I'm not yet coordinated enough to do much drafting while I'm spinning, it all just gets away from me. Way better! But my singles are still a little too thick for the worsted weight yarn I'm hoping to achieve. Here are 3 finished skeins of yarn. They're all 2 ply, the one on the left was made from a bonus from Paradise Fibers for buying the spinning wheel, the roving is Ashland Bay Colonial Wool in Multi Burgundy, and the other 2 are from my own hand dyed superwash merino rovings. I'm pretty embarrassed about the 2 on the right, but I feel like I'm getting a lot better! I don't know what Ill do with them, if anything, there's not really enough yarn to knit much with, maybe I'll use them for a stripe on a hat or something. I'm very happy learning to spin, I'm really looking forward to being able to spin enough quality yarn to make a sweater for Stella with. Truth be told these pictures were what really put me over the edge and decide to buy a spinning wheel!